The purpose of this project is to reslope the streambank to a 2:1 or 3:1 slope from its near-vertical state, to reduce erosion and allow for the establishment of woody vegetation. This project site is 358 linear feet of a heavily damaged, ditch-like creek. The streambank is composed almost entirely of fill, especially gravel and concrete chunks. After completion on the removal of the debris the site was hyrodseeded with a native seed mix and then covered with Erosion Control fabric. Snowberry and Woods rose were planted on the site. A few sedges and rushes were planted at the toe of the slope. 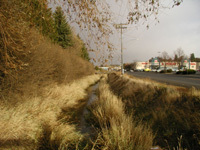 The stream segment has near vertical, slumping, eroding streambanks with little vegetation that are contributing to the sediment load in the creek. Paradise Creek has been dredged in the reach many different times, which has added to its degraded state. In the past the City of Moscow has dumped asphalt on to the sides of the bank in an effort to stabilize the side.